TheRustedChain - The Blog: 10 Dirty Pigs. That's what I had printed on my new canvas I received from CanvasPeople.com. Their service was fabulous and my canvas actually arrived early, ahead of the expected delivery date! Who wants dirty toes on their wall? For now, I just popped it up on a nail that was already holding something else. I could've picked something normal like my kid's faces or flowers or something, but I just loved the look and feel of this one. I can't wait to live in our new farm house and have these cute little feet on my wall! I have a feeling these feet will look a lot like this all summer long. I love that canvas! Maybe I should get my son's dirty little piggies put on one, too. :) It's going to look great in your new house! LOVE the canvas! Summer can NOT get here fast enough!!! Cute little piggies. I like the look of art that is "outside of the box"
Your eye is just absolutely amazing Beki!!!! That picture is just beautiful, so unusual, something I would never think to take a picture of!!! I'm so excited for your move, and to see what new beautiful photographs you come up with from the farm!!! I love that shot! You did great! Sooo cute! Congrats on your new farmhouse...how cool! Can't wait to see it all! It seems you are just right for this new house! :) I need someone to rub off on me and help me let my kids get dirty feet. No bare feet outside! haha I'm such a mean momma. I would have never thought to do that, but it looks so good! What a unique piece for your new home. Oh my goodness! 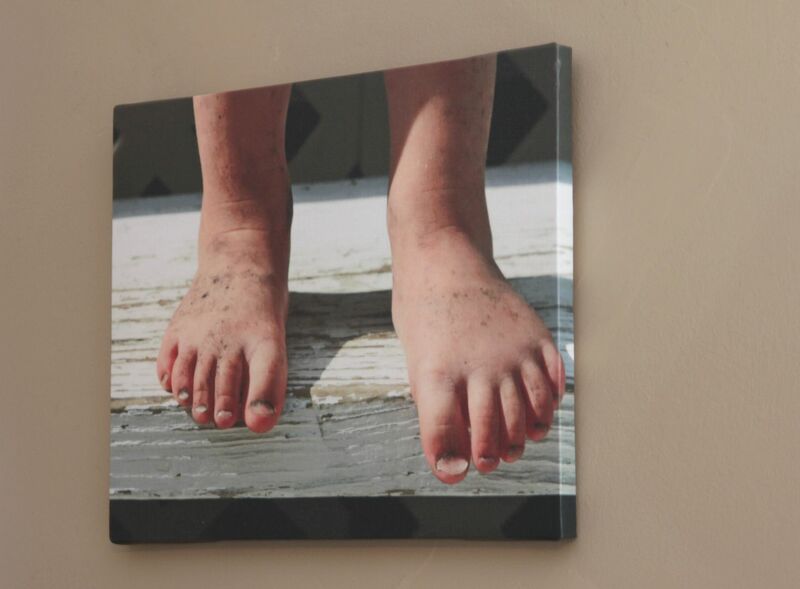 I love that you did those cute little feet...the canvas looks wonderful Beki!!! It will look GREAT in your farmhouse! I think it's a great picture...so cute & quirky! I can't wait for summer & some "dirty little piggies" around here:) P.S. Thanks for stopping by my blog! This is what makes you a good photographer. You see the beauty in things that others might miss. I think it's great! I absolutely love this! It really make my spring fever worse, because I LOVE to go barefoot in the dirt!